GOALS win games and the purple goal patch that St Columba’s Portaferry hit immediately after half-time in yesterday’s Danske Bank Kirk Cup final sealed a second Ulster Schools’ hurling title of the season for the peninsula side. 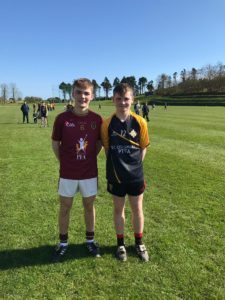 Paul Fitzsimons buried the first and within three minutes Francis Caldwell had added two more while Callum O’Neill’s strike made it 6-5 to 1-10 and the end line was in sight for St Columba’s. That was in contrasst to the start of the game. Downpatrick opened brightly and led by 0-5 to 0-1 after 12 minutes, with three of the points coming from Eoin Magee. A goal from Jon Fisher gave Portaferry a foothold and the teams exchanged points before a long free from goalie Callum Lavery went all the way to the Red High net. Tom McGrattan who was having a brilliant game hit back with 1-1 and Eoin Magee’s fifth point of the half made the difference at the turnover. After that explosive opening to the second half, the game settled again and McGrattan’s second goal gave Downpatrick a chance at 6-8 to 2-12. But Kirk Eccles cancelled it with a brilliant strike in the 53rd minute while Red High sub Fearghal McManis finished the scoring with yet another excellent goal.